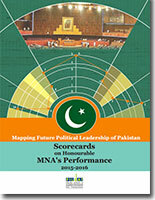 In June 2016, PILDAT took a first-of-its-kind initiative to assess the performance of the elected leadership of the Senate of Pakistan, traditionally considered the upper house of the parliament. The performance of individual Senators during the Thirteenth Parliamentary Year of Senate (March 12, 2015 to March 11, 2016) was carried out using an indigenous but scientific framework. After the release of this report, many thinkers and political experts proposed to us to undertake a similar exercise for the Members of the National Assembly of Pakistan (MNA). Hence, we decided to take this task up with the overall objective of fostering transparency and greater democratic accountability in the country and to help in the mapping exercise for the future political leadership of Pakistan.